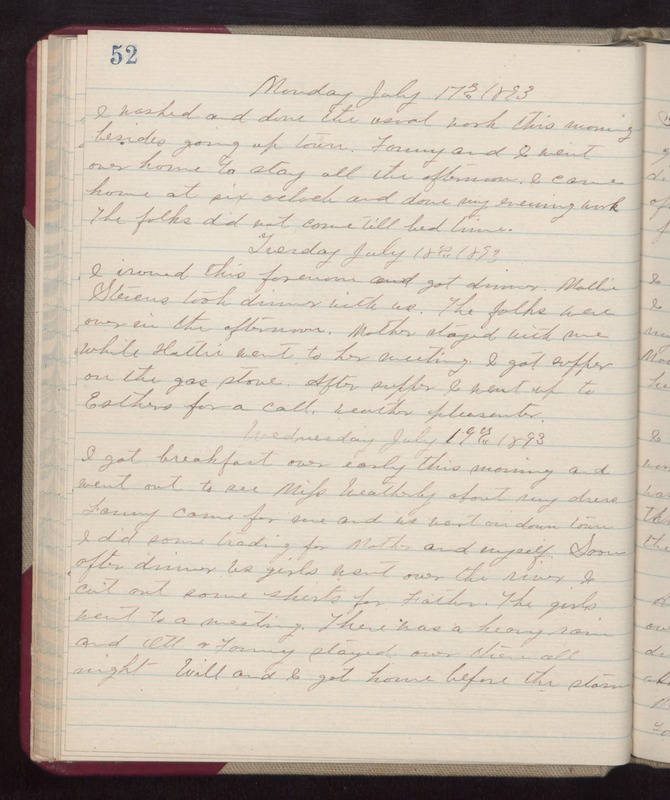 Monday July 17th 1893 I washed and done the usual work this morning besides going up town. Fanny and I went over home to stay all the afternoon. I came home at six oclock and done my evening work. The folks did not come till bed time, Tuesday July 18th 1893 I ironed this forenoon and got dinner. Mollie Stevens took dinner with us. The folks were over in the afternoon. Mother stayed with me while Hattie went to her meeting. I got supper on the gas stove. After supper I went up to Esthers for a call. weather pleasanter. Wednesday July 19th 1893 I got breakfast over early this morning and went out to see Miss Weatherly about my dress. Fanny came for me and we went on down town. I did some trading for Mother and myself. Soon after dinner us girls went over the river. The girls went to a meeting. There was a heavy rain and Ott & Fanny stayed over there all night. Will and I got home before the storm.